Everything Just So: What Do You Think of This Cartier Tiara? What Do You Think of This Cartier Tiara? One of the pieces sold at Christie’s during their latest “Magnificent Jewels” auction last week was this very dramatic tiara of coral, pearls and diamonds by Cartier. I knew it seemed familiar when I saw it and sure enough I found a picture of it in Amazing Cartier: Jewelry Design Since 1937 by Nadine Coleno. The photo caption says the parure is from 1954 but I don’t think that includes the tiara, which is probably older, though the book does not say when it was created. If you do know what year it is from, tell me in the comments! The photo is originally from L’Officiel de la couture et de la mode 393-94, 1954. I’m not a big fan of tiaras to begin with—brooches in the hair, yes, tiaras, not so much—and I don’t know what to make of this one. The craftsmanship, of course, is superb, it is one of the most unusual and memorable tiaras I have ever seen, and I think the model looks gorgeous in it, but I may only like it on her because I like all the other jewelry she is wearing, her dramatic dress, and her look, so very 1950s. Would it work today? Gallery text description of the tiara. The tiara was from the Collection of the Metropolitan Opera Guild—I could definitely see this worn by a lady performing in an opera!—and the auctioneer said the money raised from its sale was going to a good cause, which is the Opera Guild and the Metropolitan Opera. The tiara sold for $775,500. Let me know what you think of this tiara and tiaras in general. 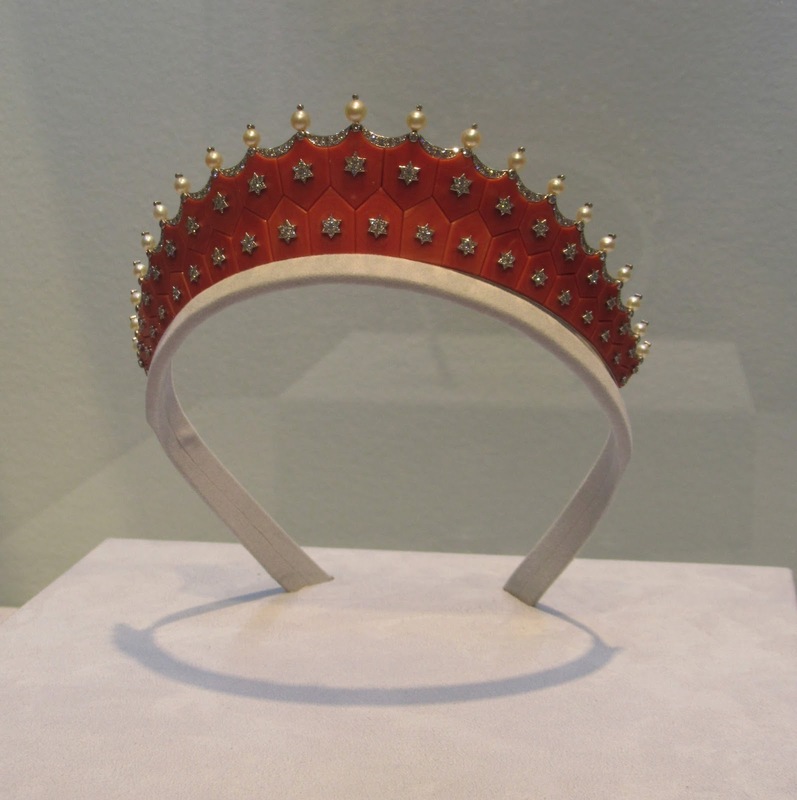 Because the tiara is so red, it reminds me of something a Czarina would wear. It just seems so Russian. As far as when this tiara was made, I don't know but my guess would be in the early 1900's. I actually really like red coral jewelry in bracelets or rings. As far as tiaras, I like them on royalty or brides (depending on the gown).